They move so fast that human eyes see only a hovering spot of color, a blur of wings. 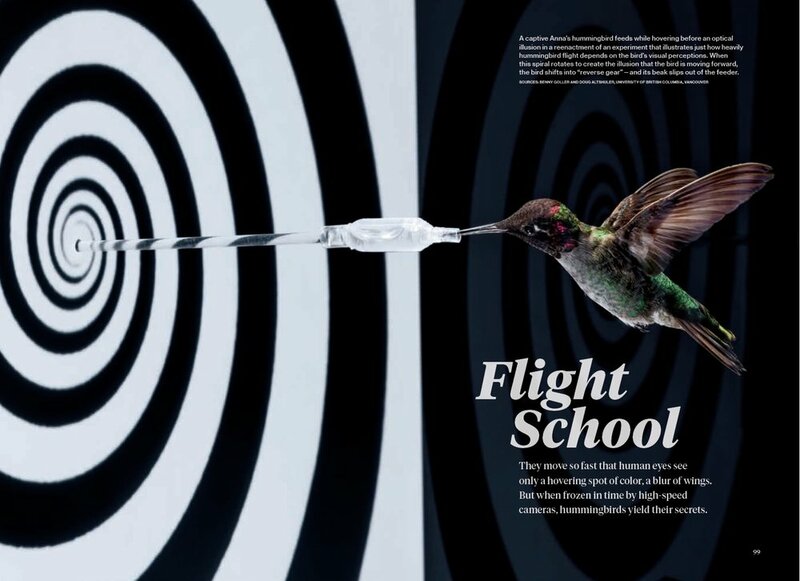 But when frozen in time by high-speed cameras, hummingbirds reveal their secrets. In pursuit of the world’s smallest bird, we’ve come to the backyard of a flamingo pink house in Palpite, Cuba. Ornithologist Christopher Clark has a car full of gear to unload: cameras, sound equipment, a sheer cube-shaped cage. Within minutes of arriving this May morning, Clark is spinning around in circles. He’s trying to follow the path of a bullet with wings as it whizzes from one clump of orange fire bush blossoms to the next. When the hummingbird pauses to draw sugary fuel from the flowers, his wings continue to beat a grayish blur too fast for the human eye to resolve.